A couple of weeks ago two Samsung tablets were imported into India for testing - the SM-T718 and the SM-T813. Those have now passed through GFX Bench and confirmed suspicions that they are the successors to the AMOLED-packing Tab S2. The SM-T819, the 9.7" Samsung Galaxy Tab S3, will have a Super AMOLED screen with 2,048 x 1,536px resolution (same as the iPad and the Tab S2). It will come with a new chipset, though, the Snapdragon 652. It sounds like a mid-ranger, but actually, it has four Cortex-A72 cores and four A53s. Compare that to the four A57s and four A53s of the S810. There are two issues - first, the 28nm build (limits clockspeed and power efficiency) and the Adreno 510 GPU. Still, early benchmarks suggest some improvement over the Exynos 5433 used in the Tab S2 generation. Moving on, little else seems to have changed. The Galaxy Tab S3 will launch with the latest Android 6.0 Marshmallow. 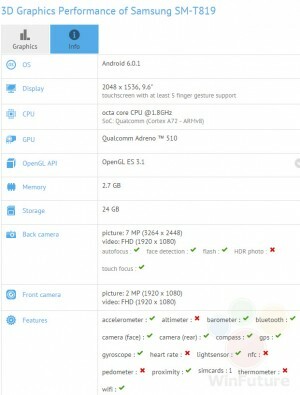 It will have 3GB of RAM, 32GB storage, 8MP/1080p main camera and 2MP/1080p selfie. 150Mbps LTE will be an option. The SM-T719, the 8" Samsung Galaxy Tab S3, will be virtually the same - same resolution as the bigger S3, same chipset, same camera. The only differences will be screen size and battery backup.